Finaalllllyyyy! As requested I’ve filmed a video on my skincare routine as I know many of you have been waiting ages for a video about the products I use on my skin! I use Dermalogica Products for my entire skincare routine, and I have been for about 5 years. Dermalogica products are formulated without artificial fragrances and colours so they are great for sensitive skin. This video features Sharon the Makeup Artistwho did an ah-mazing Kim Kardashian style contour makeup look on me. I don’t heavily contour my face very often — only for special occasions and some photo shoots because wearing makeup everyday (let alone heavy contouring) is really harsh on your skin and throw in all the pollutants in the air and oil that our skin naturally produces and you really need to be cleansing your skin everyday which is why I use a 6 step Dermalogica skincare system. Head on over to Sharon’s YouTube Channel to watch the gorgeous contour makeup look she did on me. You can find all my skincare products in my Beauty Box. If you have any questions leave a comment below and I’ll get back to you! 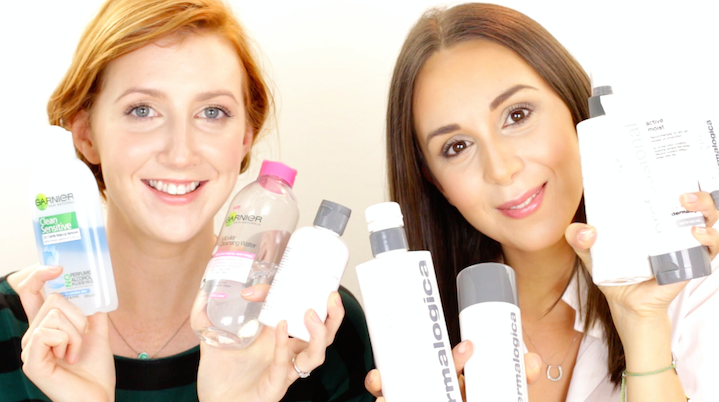 PS - If you can’t watch this video right now, here is my 6 step Dermalogica skincare routine. I double cleanse by starting with PreCleanser, it’s a plant based cleansing oil made up of Olive, Apricot and Kukui Nut oils that break down make-up, sunscreens, oil-based debris (and even Waterproof mascara) to prepare your skin for cleansing. After breaking down all the makeup on my face its time to clean it all off using Special Cleansing Gel, it’s a soap-free cleanser which contains calming balm mint and lavender extracts so it's soothing and super gentle in removing toxins and impurities without disturbing the skin’s natural moisture balance. My skin feels so soft and clean after these two steps! I exfoliate my face everyday with Daily Microfoliant (Yes - everyday)! It's a VERY gentle rice based exfoliant that micro-exfoliates dead skin cells leaving my skin smoother and brighter. Once I’ve finished cleansing my skin I prep it for moisturiser absorption using Multi Active Toner - it’s contains Arnica and Cucumber extracts which help keep skin smooth and refreshed. After toning its time to moisturise. I use Active Moist which is oil free and lightweight, it’s really hydrating but not greasy at all — it’s so light that I even apply before I do my makeup. It contains Silk Amino Acids and a unique combination of plant extracts that help improve skin texture and combat surface dehydration. The last step is applying a targeted moisturiser for my eyes. I use Total Eye Care, it conceals dark circles, relieves puffiness and reduces fine lines. You can find all my skincare products in my Beauty Box and if you have any questions leave a comment below and I’ll get back to you!